What If He Doesn�t Grow Up? I am stuck in a job I hate!!! Is your Relationship running into trouble? Divorce. Separation. Live-in strangers. Abuse. Constant bickering. Infidelity. These are issues that are of increasing concern. The concept of the happy family is being threatened by the prevalence of dysfunctional relationships. “Long term relationship” is fast disappearing as a relevant term. 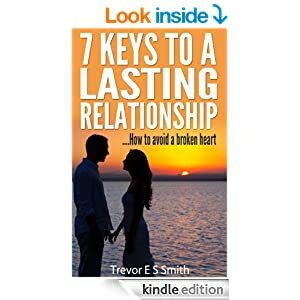 “7 Keys To Lasting A Relationship – Trevor E S Smith – Amazon Kindle” deals frontally with the increasing trend towards broken relationships, including heart rending divorces and the hostage spouse syndrome. Any couple that mindfully takes the practical prescription that this book offers is guaranteed prolonged joy and fulfillment. This is a rare values-based approach to dealing with the challenges of sharing lives that might have been shaped under different circumstances. Years of culture, socialization, gender and numerous other factors collide in a relationship. Special care and coaching is required to smooth things out and to create sustainable harmony. The “7 Keys To A Lasting Relationship” is a must-read solution for anyone who is in a relationship or hopes to enter into a long term one. The book includes a no-holds barred check-list guide to Finding The Right Partner. Anyone who completes the check list seriously reduces the chances of being trapped in an unhappy relationship. They can also use it as a guide to improving happy existing relationships. Make a difference – give yourself or a friend a lasting gift today. Broken homes and people trapped in miserable relationships are key sources of many of the ills that plague societies today. Domestic violence and poor parenting are just two of the manifestations that we have to power to combat. Finding Mr. or Miss Right is life changing activity for many. One of them might be someone close to you. Make a major difference in a friend’s life. Give a gift that lasts. This relationship healing missionary book is available on Amazon.com at NO COST March 10 – 14! Make a note in your calendar and share the link above with others. Kindle books can now be read from any browser with Kindle Cloud or on your PC with Kindle for PC. You can move the process to a higher level. Complete this form for access to the revolutionary Relationship Success DNA Report And Manual and to get more information on support for lasting relationships. Trevor ES Smith is an author and people skills and performance enhancement specialist with the Success with People Academy. He is a hands-on practitioner in the areas of Inter-personal relations, Marketing, Sales, HR and Management processes. He presents unique perspectives on inter-personal relationships, leadership, team building, customer service, technology and time mastery.